Drill bits are designed to do one thing: make holes in stuff. That is, except when they are intended to drive hardware, or sand wood, or, well… it’s not as simple as buying a set from the hardware store and havin’ at it. 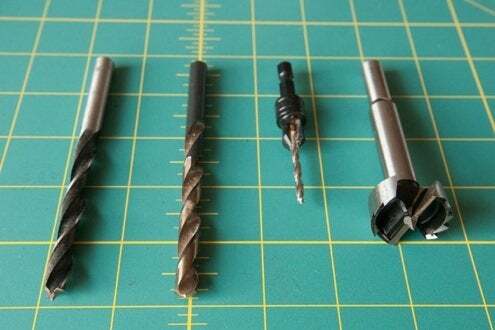 So here is my breakdown on common bit types, with advice on how to choose the right drill bit for the task you’re planning to tackle. 1. Brad-point bit: This is a fluted bit with a special spur on the tip, which inserts itself into wood and keeps the bit firmly in place, allowing you to drill a clean entry hole. Generally coated in titanium, brad-point bits remove waste efficiently and make speedy work of jobs requiring a high degree of detail. 2. Twist bit: This standard “kit” bit has a cutting point and, like the brad-point, is fluted to remove waste. Though by far the most common type in this discussion, the twist bit is actually meant to drill into metal at slow speeds; use it wisely in household DIYs. 3. Countersink bit: Designed to create a tapered pilot hole or countersink for flush screw heads, this guy can save you loads of time. Stock up! 4. Forstner bit: Boring precise, flat-bottomed holes in wood, Forstner bits create the cleanest finish you can get with holes greater than a half-inch, but they’re better suited for drill presses than hand drills, as they require considerable force to be applied when removing waste material. 5. Spade bit: Also called “paddle bits,” these are geared toward rough boring in wood. Since the cutters are so large, spade bits facilitate drilling large holes and are the right choice if you’re running wires, cables, or pipes that won’t be seen. 6. Hole saw: Used for making fairly large holes in sheet goods and other thin materials, hole saws work faster than Forstner bits, removing only the outer perimeter with their saw teeth (rather than the entire waste of the hole). Buy a quality mandrel and several sizes of hole saw to use on the same chuck hardware. 7. 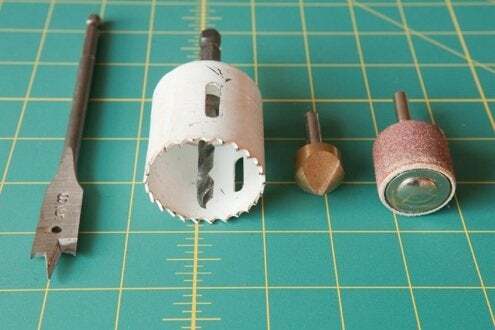 Countersink cutter: Occasionally necessary for atypical hardware (in cases where the countersink bit is inappropriate), this type of bit creates a steep chamfer for the purpose of countersinking hardware. 8. Sanding drum. Different from the other bits in this roundup in that it doesn’t produce a hole, the sanding drum is installed into a chuck to smooth out curves and other non-planar shapes at high speeds. Essential in my toolbox, these often come in kits and last… forever.